Air traffic controllers must be having a tough time of it lately, what with the skies being clogged up with so many world saving types in capes. We are experiencing something of a comic book renaissance, with a soaring number of superhero movies filling up multiplexes; rich with depth, complexity and emotion. However, for Brits there is one movie which trumps them all. This is of course 1978’s Superman, starring the square jawed and perfectly cast Christopher Reeve as the man of steel himself. The classic film has been voted the UK’s favourite Superhero movie, with relative whippersnappers The Dark Knight and Deadpool coming in at second and third place respectively. Virgin Media commissioned this research to mark the launch of their new TV advertisement where famously speedy Olympic Games champion Usain Bolt features as ‘Super Bolt’. For this research, 1,000 UK non superhuman adults were polled. 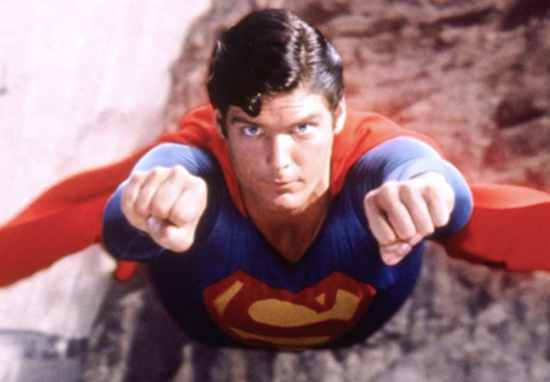 Superman was a mega hit, convincing a generation of movie goers that a man could truly fly while raking in a meteoric $300 million at the box office. The star studded cast included Gene Hackman as Superman’s evil arch nemesis Lex Luther, and Marlon Brando as Jor-El; Kryptonian scientist and Superman’s true father. The poll revealed we are big bunch of nerds at heart, with four in 10 Brits wishing they really were a superhero. And we have clearly been giving this fantasy some serious thought. Men would most want to be Superman whereas women would most want to be Wonder Woman. The most popular super power of choice would be invisibility, which certainly points to us being a nosy lot. Flying abilities and the power to time travel came in joint second place. This poll also looked what people’s costume of choice would be, if they were ever called upon to save the planet from evil forces. Forty-five per cent would wear gloves while six in 10 would accessorise our costume with boots. Interestingly, 43 per cent of us would plump for a tight fitting body suit; no doubt to show off our rippling, superhuman muscles. About two-thirds of us would customise our look with a symbol. Popular choices included a peace symbol, a star and a patriotic flag. Superheroes have never been more popular and that’s certainly evident in the survey results. It’s remarkable just how many of us wish they could be a superhero – who wouldn’t want super powers? Would Superman be your number one choice?